In 2013 actor, writer, director, playwright, broadcaster and journalist Lookman Sanusi will celebrate 30 years as an actor. Having grown up in Lagos, he started his career in Nigeria, namely at the National Theatre where he worked with many notable talents from the Nigerian theatre industry as he honed his craft. 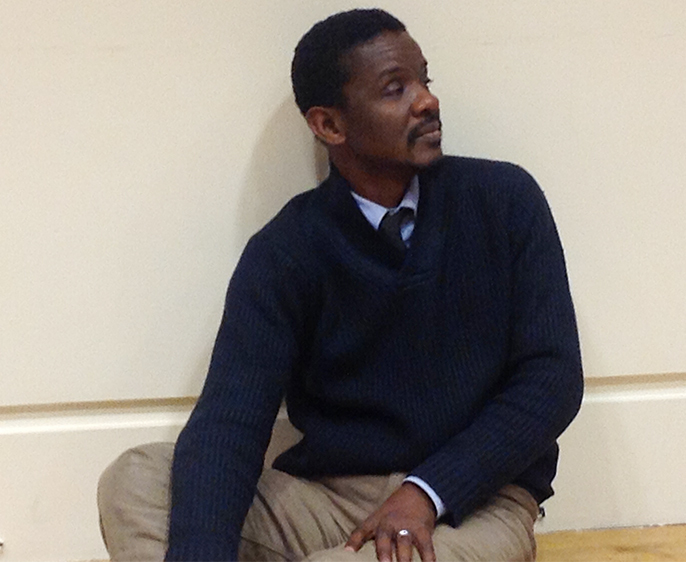 He has written 20 full length plays and won an award for his stage production, Skeleton. Since 1989 he has been running his theatre company, Bubbles, which has also produced many plays. 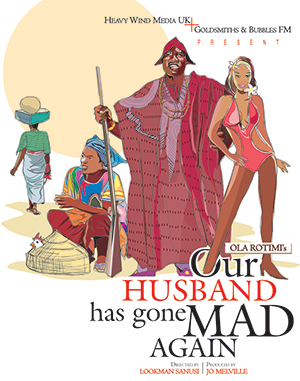 In 1983 he appeared in The God’s are Not to Blame by Ola Rotimi, now 30 years later he pays homage to the late playwright as director of Our Husband Has Gone Mad Again. This festive season, the play makes its London premiere at Goldsmith’s University offering an alternative to your usual pantomime. What makes Our Husband Has Gone Mad Again poignant to the festive season? It is a classic African comedy set in the 1960s and it’s funny from start to finish. It’s the kind of play that people should enjoy with their family and friends and makes a lovely Christmas gift especially if you are African-Caribbean. We want to project our own cultural diversity in the midst of the London pantomime season so people can take themselves out and have fun. This is why we are staging this classic comedy during the festive season. We thought we shouldn’t always wait for the Arts Council instead we can encourage corporate outfits to support us and let people know we have loads of talent amongst African-Caribbean actors. The play will be staged at Goldsmith’s University. Why there and not a traditional theatre space? Goldsmith’s has a tradition of supporting African plays and is fast becoming a hub for African plays and theatres so we approached them for collaboration and they welcomed the idea. We hope it won’t be a one off and plan to move to other theatres to show this particular play. 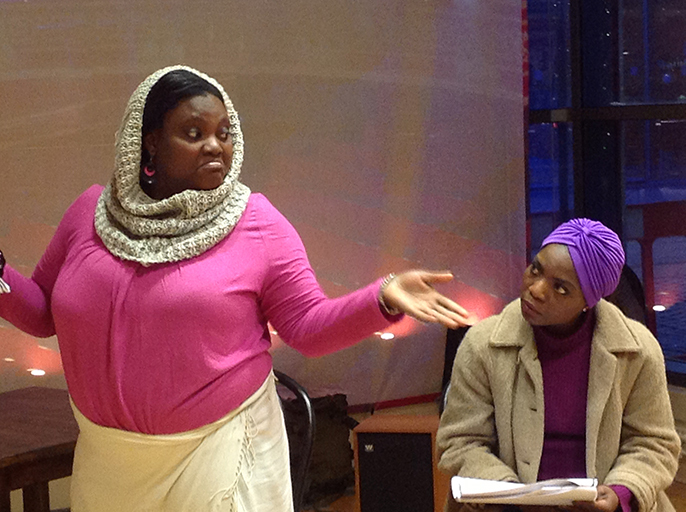 Why did you choose this play over others by acclaimed playwright, Ola Rotimi? The message is relevant especially to Nigerians as we have to grapple with political issues in Nigeria and getting things right, also it throws open the anomalies happening now. 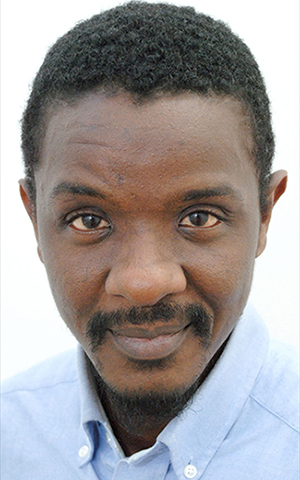 Ola Rotimi is one of the best writers that Africa can present. He died in 2000 but I knew him personally and respect him. In a way we’re paying homage. There are other playwrights we respect too, like Wole Soyinka but we wanted to honour the late Ola Rotimi as he is no longer with us. As the director of this play why should people come and see this production? I did this play in Nigeria about two years ago. With this version we have over 150 years of experience between us. I believe it would be fascinating for people to come and see. The actors want to do this play and I can assure anyone out there that they are going to have a wonderful time. The actors are enjoying playing their characters and the audience will leave satisfied, and tell others to see this play. I guarantee you will enjoy it. I will try to bring out Ola Rotimi’s essence and let people see an authentic African play – this is a key factor in putting on this production. I will try to bring out Ola Rotimi’s essence and let people see an authentic African play – this is a key factor in putting on this production. Are there any themes and issues in the play that you can relate to personally? [Laughs] Well I don’t have three wives, and I’m not into politics. But what I find interesting is when people entangle themselves in any kind of web whether it be financial, marriage or political there is always an expiry period – just keep your sanity and things will work out. Problems and challenges are there for us to surmount. Nigerians in the UK are making a big impact on the theatre industry over here. What are your thoughts on this? That’s an interesting question and one of the reasons we are doing this play. If you look around you there is a lot of British/European plays around us and few African-Caribbean plays. People are yearning for more and want to come to the theatre and relate. There is not enough so we have to step it up. Another thing fuelling this is the outburst of Nollywood films and people coming over from Nigeria for film premieres. We hope to tour this play early next year as our producer, Jo Melville, is speaking to other theatres too. Who has had the most positive impact on you in terms of your passion for theatre? That’s a tough one… A really tough one as there’s not just one person… I would say Ola Rotimi, as I was close to him when he was alive and Wole Soyinka because I am influenced by their work and respect their work a lot. Tell us about some future projects you’ll be involved in. Heavy Wing Media operates Bubbles FM and in 2013 we have a programme launching with Z Mirage called the Arts in Global Conversation. It’s going to be a monthly programme where we discuss matters of the arts across the globe. It will be broadcast live by Bubbles FM and accessed online where people can contribute across the globe. We have the reach and we want to build on that – this will be from March or April 2013. Our Husband Has Gone Mad Again will play at Goldsmith’s University from 17-20 December.